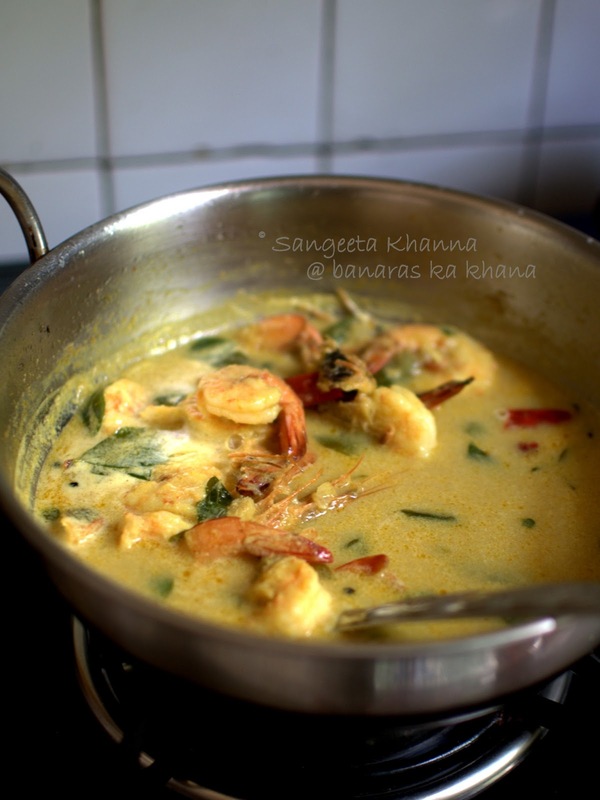 Since I love coconut milk based curries and cook my prawns almost all the time in one or the other coconut milk recipe. 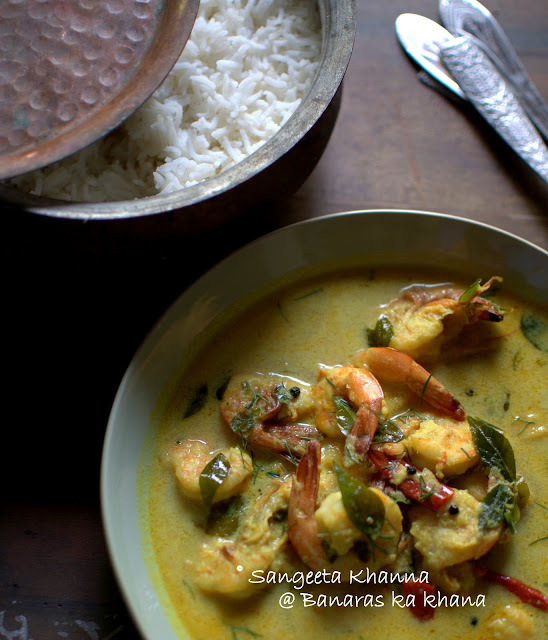 Be it the bengali chingri malai curry or the kerala style prawn curry. This coconut milk based shrimp curry inspired from Kerala nadan chemmen is enjoyed by both of us and whosoever has tasted it till now. The spice content is toned down from the authentic version as I have burned my hands with a good purist recipe once. It was so high on spice level that the delicate coconut milk and shrimp flavor got lost. I have mellowed down the spices since then for this particular curry. I am using the names prawn sand shrimps interchangeably, but both are different species. In the lot I got this time had both of them. I don't find the taste too different so use the name interchangeably. Getting the prawns or shrimps whole is the best way to start with them. The shells make a great stock to cook the peeled shrimps. If you get frozen, don't worry, you still get great tasting curry. Clean the shrimps, discard the dorsal vein but reserve all the heads and shells. I prefer retaining the tails attached to the shrimps. Some of the heads too as it gives a nice taste in the curry. Smear all the cleaned shrimps with salt and turmeric powder. Simmer all the shells of shrimp and heads with a liter of water for an hour or more. Decant or sieve the stock and reserve. About 500 stock will be made. Make a smooth paste of ginger and onion, keep aside. Heat coconut oil in a deep pan or kadhai, add the curry patta, the whole spices and onion and ginger paste and fry for a minute or so. No need to brown this paste. Just cook it lightly. Tip in the shrimps and toss it for a couple of minutes till they start turning pink but not cooked. Pour the stock at this time and simmer the mix for 5 minutes. If using coconut milk, add at this stage, half the quantity diluted with water or the thin extract. The thick extract or half the coconut milk will be added after five minutes of boiling. Add a slurry of coconut milk powder and simmer for a couple more minutes. 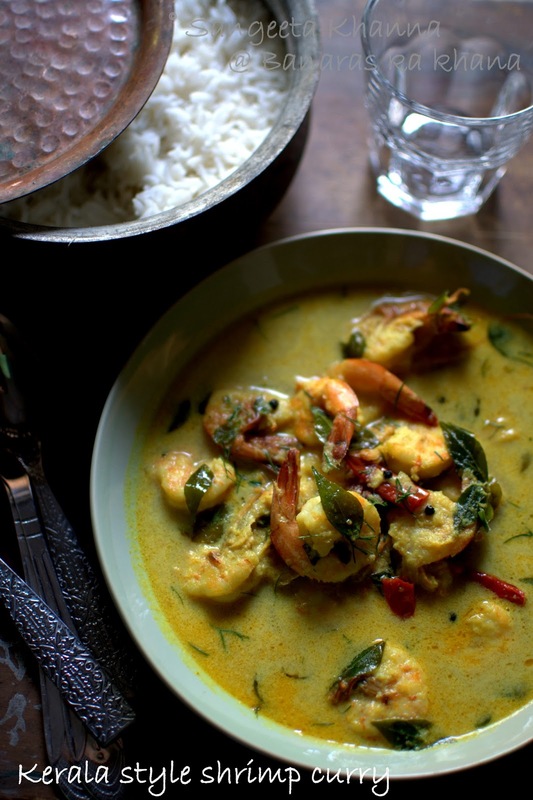 Serve hot with plain boiled rice, garnished with chopped coriander greens. Very delicately flavored, richly coconut and very very fragrant. Mild whiff of fennel and green cardamom, very faint hint of fenugreek and the peppercorns are a teasing kick. This is something you would look forward to leftovers and still wont have. The dish will be polished off however you plan for leftovers. That good. The spicing has been adjusted to my liking after 3-4 trials of the authentic recipes and may be the purists find it too mild. I suggest to try this this proportion of spices if you are having this curry for the first time. Adjust to your taste after the first trial. The stock adds a lot of flavor so try and do that if possible. I am sure you would love this flavorful classic curry. Do let me know if you try. Vegetarians can cook a mix of vegetables in this curry or just potatoes and baby onions.